Some days maintaining one (or more) social media channels can feel overwhelming. Posting fresh, new content, responding to comments, watching your feed for mentions, answering private messages. It can feel like a never ending spiral, especially if it’s not your only role. To stay in your followers’ feeds, and to build your online network, you need to continuously feed the beast. It is just the way social media works. I know you are faced with a range of issues managing social media when working in government. When working in government you can often feel pretty constrained in what you can post, and that can lead to content which is pretty stilted and written in government speak. Sometimes remembering how to write good content when faced with these challenges is hard! To make it easier for you here are some ideas to keep in the back of your mind – it’s not rocket science but I think these are the basics you need to create more effective content. Have a clear purpose – Every time consider why you are posting? Will this content raise awareness, educate, inform, support or share? Know why you are putting out this content to your followers. Too often we just post because we think we have to and that devalues other content. Targeted – Know who you are talking to and what they are interested in. Make sure you create or share content that is relevant to your audience and to your program/policy. Quality posts – You are fighting for attention in a busy, creative space. Make sure your post is as good as it could be by knowing the “rules” of the different channels and posting at the right time for your audience. Well written – Make sure your post is well written, clear, and spell checked! Knowing what success looks like – If you are just posting anything and everything you should not be surprised that you aren’t getting a lot of engagement. Part of successful content is knoing if you are trying to generate conversation or trying to get followers to share your content. 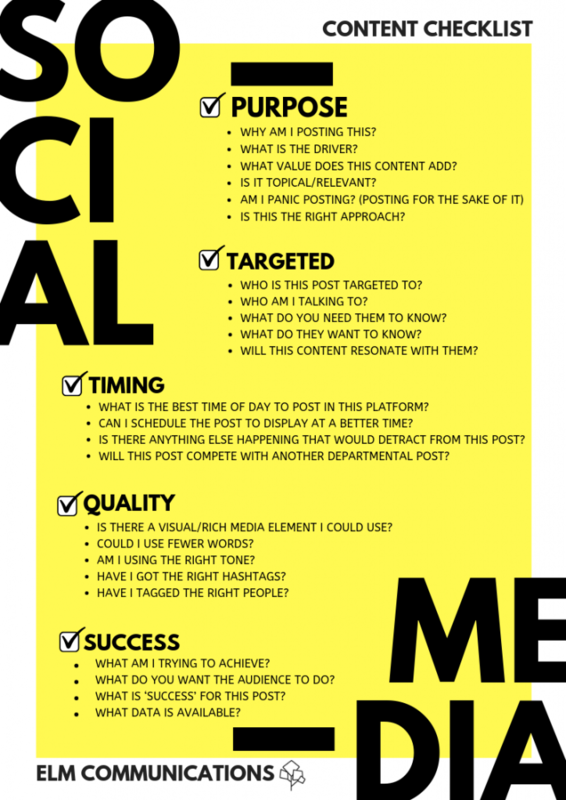 Here is a little checklist to help keep you focused when you are writing social media content. Note: click on image to download PDF. Good luck, managing social media channels are hard. But you are better off having good content than just any content to fill your feed.